Moroccan Spatchcock Chicken with Crispy Potatoes & Carrots - Recipe! - Live. Love. Laugh. Food. Weekend meals don’t have to be complicated or fancy, just slightly better than you would make during the week when time is tight. 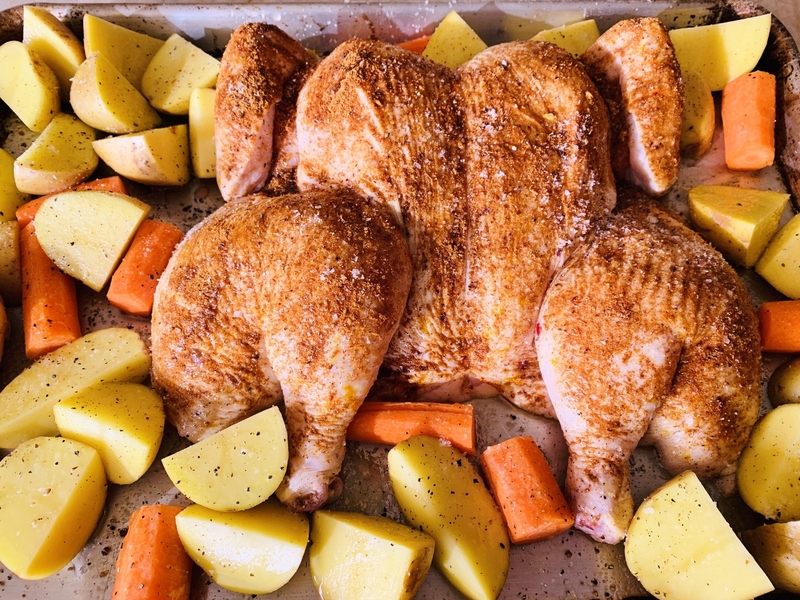 Roasting chicken is always a fantastic choice, but why not try something a little different and use an ingredient you may not be familiar with, or have currently in your pantry? Ras El Hanout is a Moroccan spice blend that is now available is many local grocery stores and definitely online. 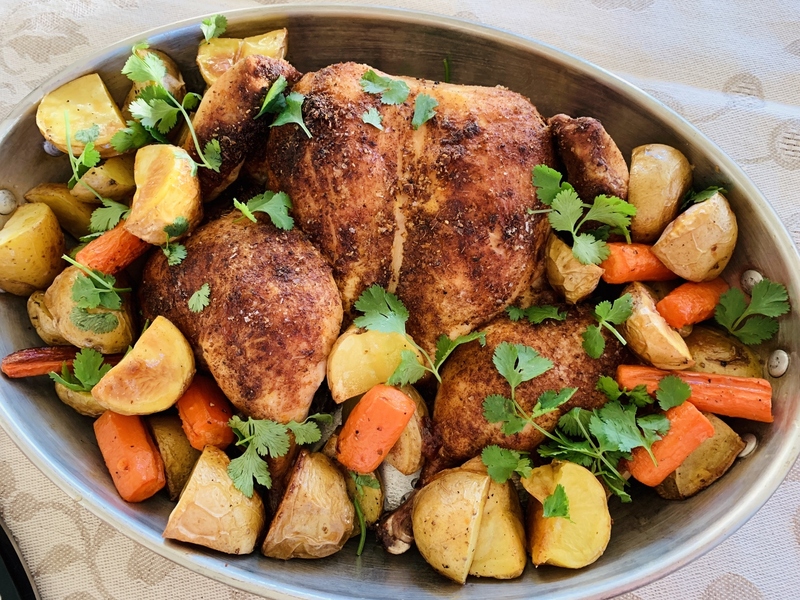 It is a warming North African spice mixture of cumin, paprika, coriander, cardamom, nutmeg and sometimes turmeric, which adds tremendous flavor to meat, especially chicken. This spice blend is no ordinary combination, it’s earthy, fragrant and deepens chicken’s already succulent flavors. What makes this spice so fantastic to use in cooking is that you don’t need to do much else, but rub it into the bird and let it rest in the refrigerator for a few hours. The herbs gently absorb into the skin and become the best aromatic coating that you can imagine. Spatchcocking a chicken decreases its cooking time and in my opinion, makes the bird taste better because it roasts low in the pan – in it’s own juices. 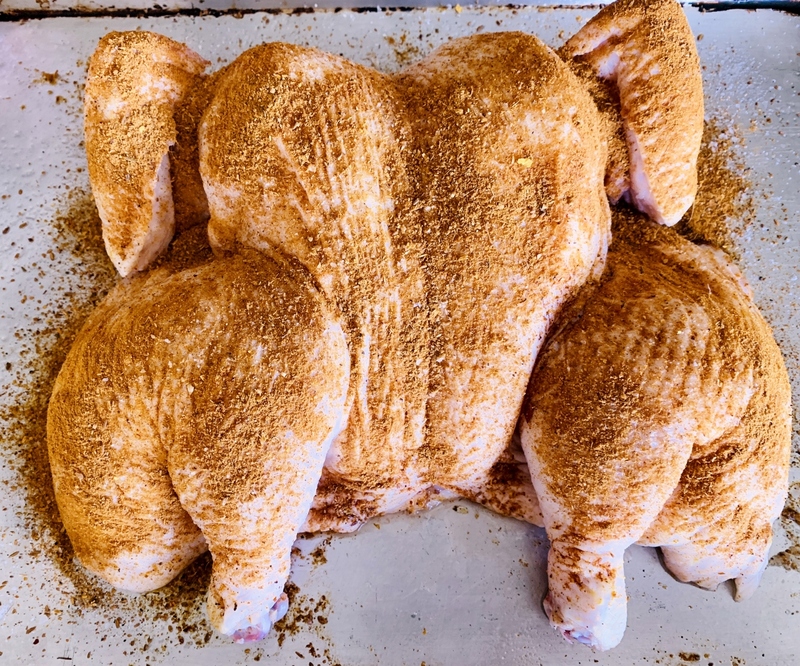 If you’re intimidated with removing the backbone of a chicken, check out my instructions and picture below – it’s pretty simple. 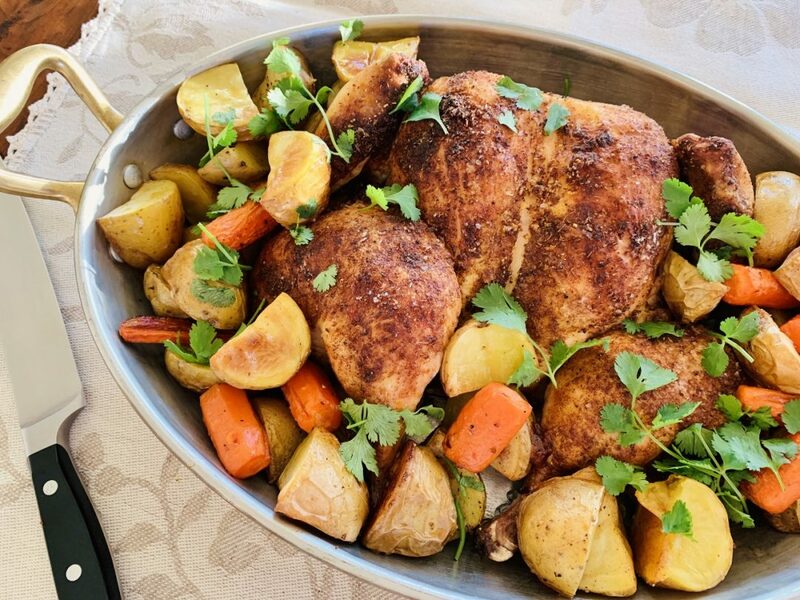 If you find that you fall in love with this cooking method, check out my two other recipes – Spatchcock Lemon Chicken roasted in the oven, or Spatchcock Grilled Chicken prepared outdoors, both are terrific. New Potatoes and carrots roast up beautifully in the same amount of time – not a lot of fuss here. The chicken and vegetables come out crispy on the outside and creamy tender on the inside, and don’t let those pan juices go to waste – pour them over the bird after slicing. A crisp white wine or fruity Zinfandel pair nicely with this meal and don’t forget to invite some friends. Place chicken breast-side down on a cutting board. 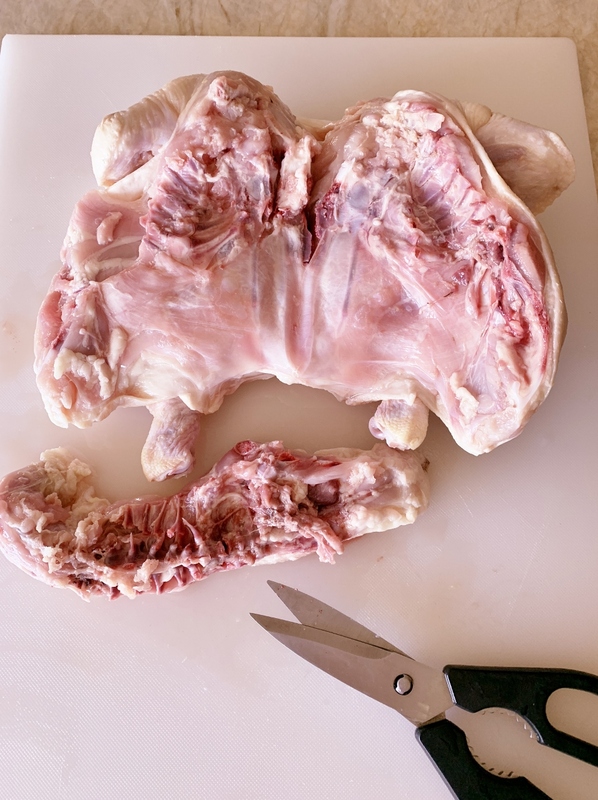 Cut backbone out of chicken using cooking shears or sharp knife. Snip sternum bone on both sides (bone between two breasts) or remove completely. Press to flatten chicken (see pic below). Flip chicken over and place on a sheet pan. Sprinkle heavily with salt and Ras El Hanout. Place in refrigerator to air dry for 4-6 hours. Preheat oven to 425 degrees. Drizzle chicken with oil and sprinkle with salt. Place potatoes and carrots on sheet pan around chicken. Drizzle vegetables with oil and sprinkle with salt. Place sheet pan in oven and roast for 60 minutes. Remove and cover with foil. After 10 minutes, slice chicken. Place in serving dish with vegetables and sprinkle with fresh parsley. 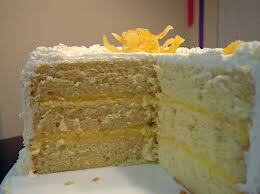 Serve with pan juices, if desired. Enjoy! 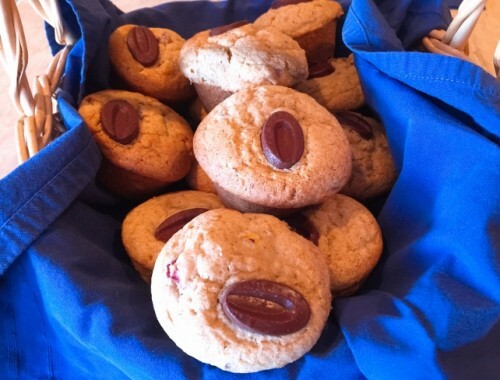 Pear Spice & Chocolate Muffins – Recipe! Gluten-Free! 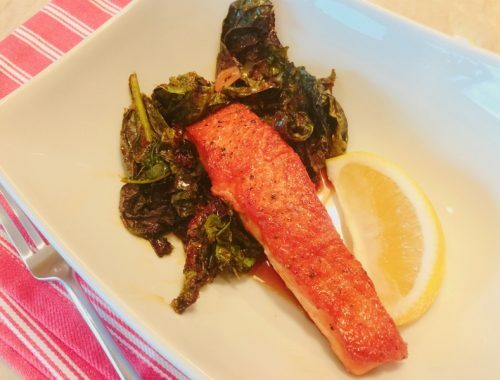 Wok Caramel Salmon with Bitter Greens – Recipe!